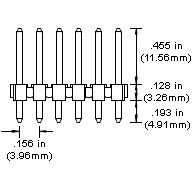 Header pin connector, 0.156-inch spacing, with friction lock. Replaces Bally/Williams # 5791-12273-08, CM15607, CM15608-S, 640445-8. 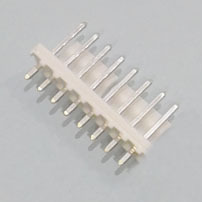 Friction Lock: Some headers come with a friction lock tab molded in to the back side which will lock into place on corresponding housings that have locking ramp tabs. Headers with friction lock can also be used with housings that have no locking ramp tabs, and vice-versa.